November's Glossybox is filled with products that are supposed to get you ready for the party season ahead. This month's box contained 4 full size items and three sample sizes which is amazing value for your money and seems to be more than you would usually get in a Glossybox. So all in all you are getting approximately €41.60 worth of beauty products for around €15. The only thing I would say is that it would be great to have the actual Euro prices of each product on the info card for the Irish customers. It's a small detail but one I'm sure the Irish Glossybox customers would appreciate. 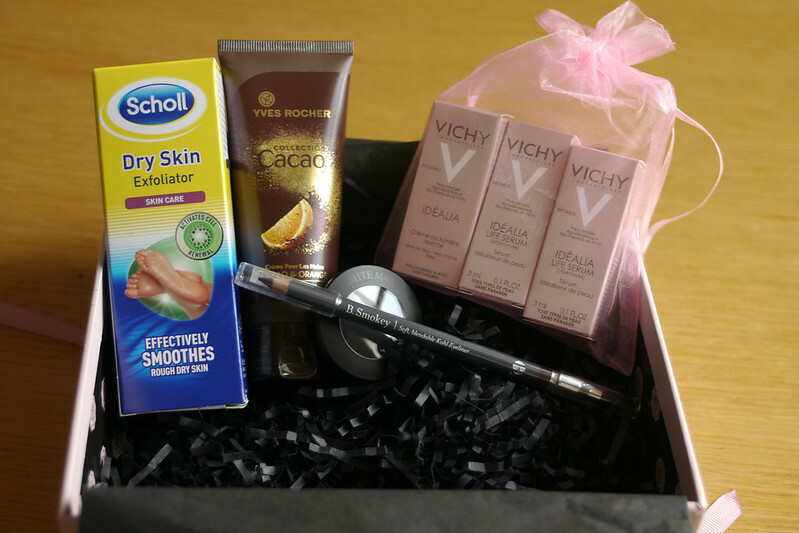 I really loved this month's Glossybox, the Scholl Exfoliator is perfect for getting your feet ready for wearing heels. I think everyone neglects their feet a little in the Winter because they are mostly hidden so I really enjoyed using this and then using my Soap and Glory Heel Genius afterwards, it's the perfect treat after a long day on my feet. The Yves Rocher Hand Cream smells good enough to eat. Terry's Choclate Orange fans will love this! I can't believe how inexpensive it is, it absorbs nicely into the skin and it's handy size to keep in my bag. Emite is a Swedish brand I hadn't heard of before. This matte black eye shadow is perfect for creating a smoky eye for your Christmas party, I like to use it along my lash line as eye liner. The B. Kohl Eye liner is a gorgeous deep purple shade , something that was missing from my make up collection and I am rather partial to a smoky purple eye so I'm dying to try this out properly. So far I've just used it a little along my lower lash line for a bit of colour. It's really easy to blend especially with the sponge tip on the other end of the pencil. I've used the Vichy Serum before and I absolutely love it, this is a definite repurchase for me, combined with the sample of the moisturiser, it makes an unbelievable base for applying make up. I'm so impressed with this range. If you're stuck for an idea for a Christmas gift, I don't know any woman that wouldn't love a subscription to Glossybox. You can purchase three, six and twelve month subscriptions so it's the gift that keeps on giving. Another option is to get somebody the Limited Edition Christmas Box that contains 6 samples this time, all adding up to £80. Have you tried Glossybox yet? Are you interested in trying it?